Follow fall protection requirements if the potential for fall hazards exist in your work area. Fall protection involves eliminating fall hazards and safely stopping a person who does fall. Fall protection is required wherever the potential exists to fall 4 feet or more in general industry activities, and 6 feet for construction activities. Departments with employees working in these situations must follow UCSD Fall Protection Program requirements. Fall protection is not required if an employee or employees are on a low slope roof (less than 4:12 pitch) for inspection or observation only, and do not come within 6 feet of a leading edge, skylight, open roof access hatch, or other floor openings that present a fall hazard. For extremely hazardous areas, hire a contractor who specializes in fall-protected work. Ensure that employees are informed, trained, and provided with the appropriate fall protection equipment. Supervisors should be familiar with the applicable state and federal safety regulations, safety consensus standards, UC San Diego policies and prudent safety practices to protect themselves and their fellow employees. Ensure the equipment provided is adequate to protect employees from fall hazards. Prohibit an employee providing his or her own fall protection equipment. Comply with this program and any further safety recommendations provided by supervisors and/or EH&S regarding the Fall Protection Program. Conduct assigned tasks in a safe manner and properly wear and use all fall protection equipment. Report any unsafe or unhealthy work conditions and job related injuries or illnesses to the supervisor immediately. Inspect all fall protection equipment being utilized by the employee prior to use. Refrain from bringing or wearing any personally owned fall protection equipment, and ensure the equipment issued is adequate protection from hazards in the workplace and is in proper working condition. Ensure two authorized workers, see glossary of terms (PDF), are present whenever fall restraint or fall arrest equipment is to be used. Exterior and interior equipment platforms, catwalks, antennas/towers, etc. Whenever an employee must step outside the catwalk additional fall protection (i.e., body harness, self-retracting lifeline, or rope grab system) must be used. Fall protection systems include all methods of protecting workers from falls from heights. See Fall Protection: Fall Protection Systems for details. Prior to work activity where fall protection is necessary, rescue plans must be identified and discussed with all employees. The supervisor must develop rescue plan(s). In the unlikely event that a fall arrest occurs on-site, personnel with the use of an articulating man-lift or ladders, where feasible, will rescue all employees. Alternative rescue options are safety ladders and personal trauma straps. Additional assistance must be sought through the local emergency services or San Diego Fire Department. Employees involved in a fall arrest or fall should be sent for a medical evaluation to determine the extent of injuries. 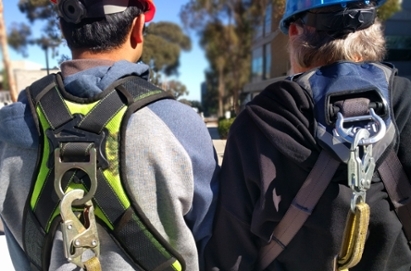 Contractors working at UCSD must follow their own written Fall Protection Program and ensure that their program meets Cal/OSHA requirements. Contractors are required to discuss Fall Protection strategies with all parties involved in the work to ensure safe interactions with other exposed individuals. Find Personal Fall Arrest Systems (Fall Protection) training at the UC Learning Center. Changes in the workplace Fall Protection Program render previous training obsolete. Changes in the types of fall protection systems or equipment to be used render previous training obsolete. Inadequacies in an employee's knowledge or use of fall protection systems or equipment indicate the employee has not retained the requisite understanding or skill.